Our MAMA KIT consists of two products – an exclusive soft breathable seamless Belly Wrap and a breathable 17-flexible-steel-bone rubber latex Waist Trainer with a layer of anti-bacterial cotton lining for extra comfort. Designed exclusively with double compression for best results, the MAMA KIT is perfectly measured in length to cover all three affected areas of post-birth - the belly, waist and pelvic. 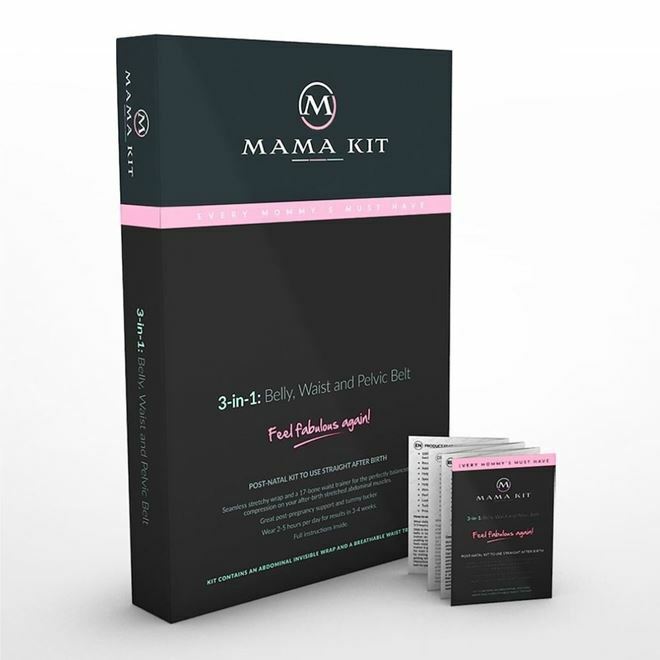 The MAMA KIT by MASKATEER was developed after extensive research and testing to find the best “duo-set” solution for you after birth that brings your flat tummy back fast and helps shrink your stretched hips caused by the pregnancy as well as setting your organs back in place. The well-designed tummy wrap and corset-like belt in the MAMA KIT, helps you lose fat around the abdominals and minimises the visibility of stretch marks. It gives support to the back and core muscles during breast feeding, tucks in the loose stomach, and gets rid of excess body water stored during pregnancy. It also helps prevent dropping or lightening by supporting the visceral. MAMA KIT helps relieve postpartum tension and pressure helping you boost your confidence while working on your stretched muscles. Go girl and be a yummy mummy! With natural delivery you can start wearing immediately if no complications. Do not use the MAMA KIT until the C-section wound is fully healed. Take off wrap or waist trainer if you feel dizzy or uncomfortable when breastfeeding. HAND WASH ONLY. See care labels. Wear on bare skin for best result. Almost invisible under clothing. For best results it is recommended to wear the MAMA KIT Postpartum Belt for 3-5 hours per day for the first few weeks. Slide in the seamless wrap onto your belly. Make sure the entire belly is tucked in and covered. After fixing the belly wrap put your waist trainer on top of the wrap. Pull down the waist trainer if it is pushing into your breast too much. Use the row of hooks that feels most comfortable. Adjust the hooks when you feel waist trainer is getting loose. After 30-40 days use of the MAMA KIT, and for even better results, move onto more intense compression wear such as our Monochrome or Couture waist trainers. If you are pregnant: Measure your waist in 2 areas. above your bump and on your bump. Then take an average measurement of the two and refer to the size chart below. Ideally it is best to wait a day after giving birth.